A dropped metatarsal head is a condition where one of the metatarsal bones (usually the second metatarsal) is lower than the others at the distal end. Patients complain of pain and the sensation that they are walking on a stone. The patient will usually have a callus under the head of the dropped metatarsal. This condition is very common and the cause is considered to be almost strictly hereditary. Overpronation does play a role as abnormal weight distributions in an abnormally pronated foot tend to throw too much weight to the second metatarsal. Orthotics should be used to redistribute the pressure and off-load the dropped metatarsal head. 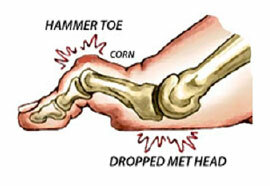 A metatarsal pad should be added just proximal to the dropped metatarsal to off-weight it and alleviate the pain.